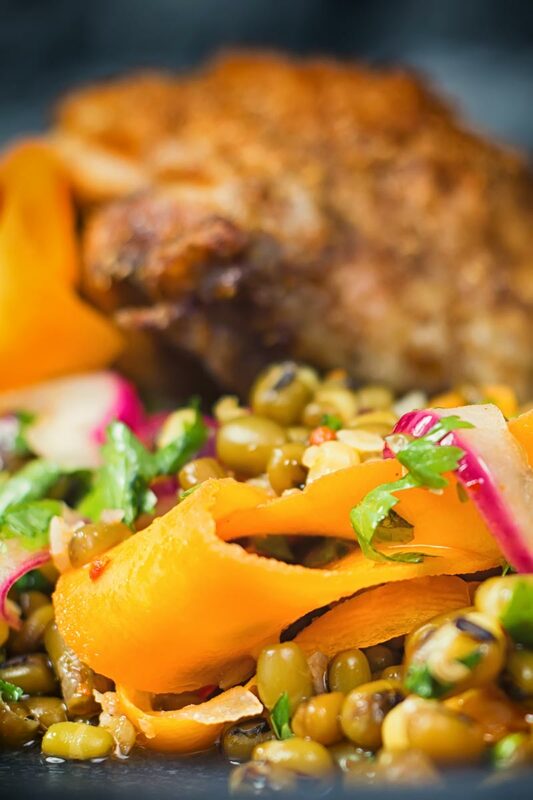 Carrot and Mung Bean Salad With Spiced Chicken Thighs. 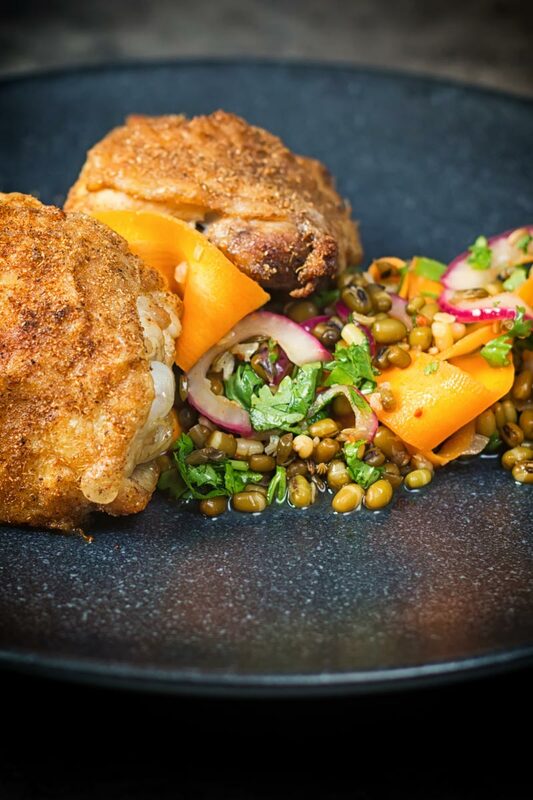 The chicken thighs are simply roasted with a sprinkling of Garam Masala so they stay moist and juicy. Of course, all of the resting juices go back through the mung beans to tie the recipe together. 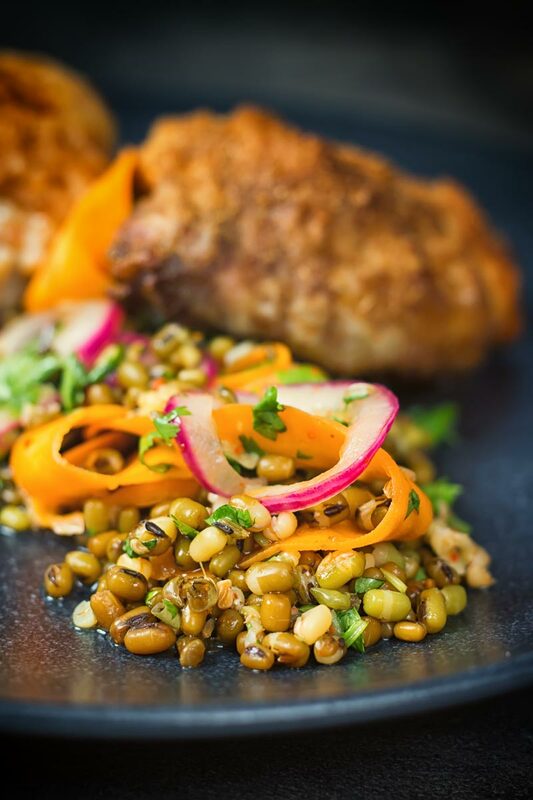 This recipe is fairly similar to a number of recipes of late, a heavily flavoured legume salad with a meat or fish focal point. 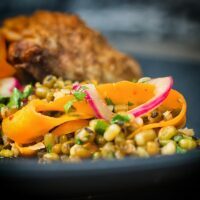 You can see a similar idea in my herb-crusted baked salmon with a lentil salad and in many ways my harissa baked pork chop with pearl couscous. Mung beans are a staple of Indian food and we all probably eat them more than we think… You know those bean sprouts you throw into a stir fry? I wrote about bean sprouts and mung beans a little more in my aloo gobi recipe. That is one you really should check out if you like curry! How Do You Cook Dried Mung Beans? Mung beans are a bit funny when it comes to beans… Unlike many they definitely have a shelf life and the older they get no amount of cooking will soften them up. They are simple to cook, just a case of soaking for 4-5 hours. You can soak for longer if you wish but there appears to be little benefit in doing so. Then it is just a case of bringing to a boil and simmering. They have very little flavour of their own. They are earthy and have a wonderful texture, but when it comes to flavour don’t expect to have your socks blown off. What you need to do is add flavour when they are still hot. So as I have done in this mung bean salad prepare your ingredients whilst your beans are cooking. Then drain them and whilst they are piping hot add in your flavours. They will be delicious and they cost pennies to buy. This makes them a perfect cheap and simple salad base! Garam masala is nothing more than a spice blend and like all other spice blends there are as many derivations as there are recipes. For the chicken thighs for this recipe use a brand that you really like. However, the most important thing with all powdered spice blends is to buy a packet that you will use. When blended powdered spices lose their flavour very quickly. They also lose their flavour at a different rate, so cumin and pepper will remain pokey for some time. But things like coriander and cardamom lose their potency very quickly. What typically happens when you buy a big packet is that the more subtle flavours and complexity of your garam masala will disappear. Leaving you with a far inferior product. I cook a boatload of Indian food, as a result, my garam masala does not hang around long! It goes in everything from my coronation chicken to my lamb madras. If anyone wants the amounts gimme a shout in the comments and I’ll gladly add them in. Although this makes around 150g so unless you use garam masala a lot you are better buying a small pack. Soak your mung beans for at least 4-5 hours. 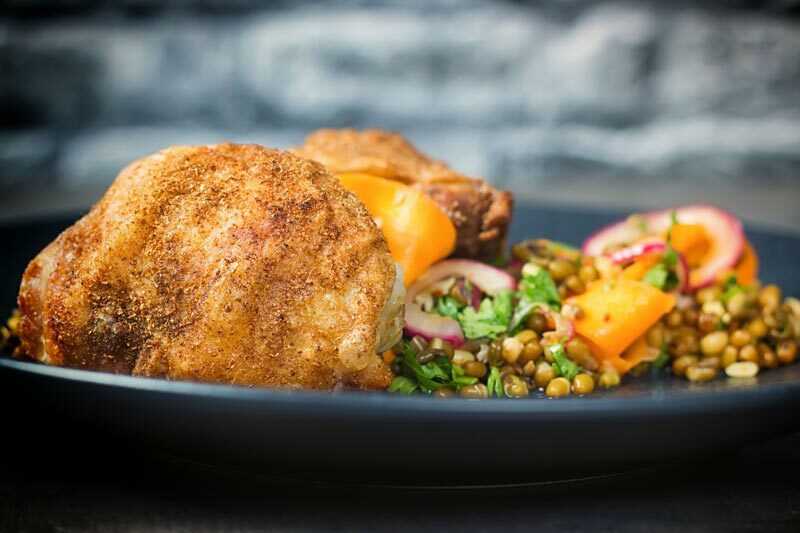 Rub the garam masala and salt into the chicken thighs and bake in the oven at 200°C or 400°F for 35 minutes. Shred the carrots into ribbons with a vegetable peeler and place in a bowl. Finely slice the red onion and place in a bowl with the carrot. Plae the vinegar, sugar, fennel seeds, fenugreek seeds and 1/4 tsp salt and heat until it comes to a boil. Pour this mix over the carrots and red onion, mix and allow to cool. You should be around 10-15 minutes of the cooking time by now, so bring the mung beans to the boil. Reduce the heat to a simmer, add in the bay leaf and cook for around 20 minutes or until cooked. Mash the garlic and mix with the olive oil and chili flakes and set aside. When the mung beans are cooked drain and place in a bowl. Whilst the mung beans are still hot add the oil and garlic mix and the pickled carrot and red onion. Mix and add in some of the pickling liquid, do this to your taste, you can also add salt as required at this stage. Allow the mung beans to sit and soak up the flavour for 5-10 minutes. This should be the perfect resting time for the chicken thighs. 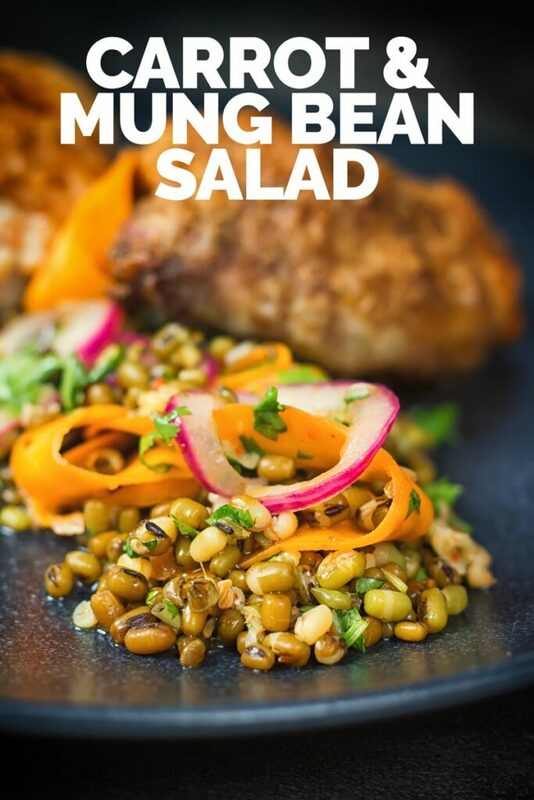 Whilst this is resting chop your coriander and stir through the mung bean salad before serving. Such a delicious dish it is. I’ve never tried mung beans before. This looks like a great recipe to try! I always try to buy my spices in small 1 oz. packages so they don’t gets tale. I also store them in airtight containers so hopefully they hold their freshness longer. You must give them a try, I think I mentioned in the post that they are one of a few sources of bean sprouts, but they make a great bean base for a salad and are fab in curries. Such a colourful and tasty looking salad! I definitely need to start putting mung beans in more of my dishes. They are a great bean with a fab texture and they carry flavour so well when hot. Wow Brian, this salad looks so colourful and so nourishing! Really love your styling and photography. Wow I can only imagine how delicious the flavors in this are!! Completely divine! What a lovely hearty salad. Just goes to show that salads can be for the cooler months too. Most definitely a year round salad!